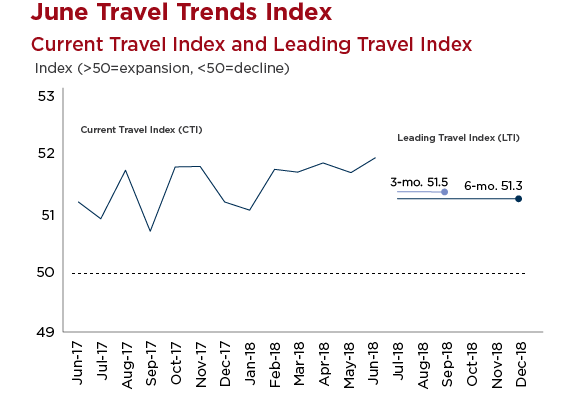 Despite this positive trend, U.S. Travel economists remain wary that growth of international inbound travel to the U.S. is not keeping pace with the global long-haul travel boom. Through the end of the year, international inbound travel to the U.S. is expected to continue to grow at a rate of 2.2 percent. However, U.S. Travel economists note that the U.S. is well off the pace of long-haul travel worldwide, projected to increase six percent in 2018. Also, U.S. Travel researchers say, storm clouds continue to gather in the form of trade tensions and rising oil prices. “Facing these potential headwinds, we urge officials to support policies and messaging that will make clear to the world that the U.S. is open and eager for business,” said Huether. Despite solid economic activity bolstering both domestic and international travel through the first half of the year, the rate of growth is not brisk enough to help the U.S. regain its slipping share of the global travel market.